Judith Borton Neuman passed away on April 20, 2018. She will be remembered as a devoted mother, wife, sister and friend. Judy was born in Cleveland in 1938, and grew up in Cleveland Heights with her brother Bob. She attended Cleveland Heights schools and then Chatam College for Women in Pittsburgh, PA where she earned her teaching degree. 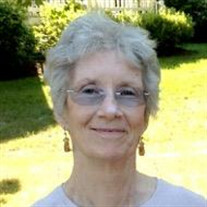 After college she went to Massachusetts to get advanced training in teaching deaf children. She then moved to San Francisco, CA for several years to teach. From San Francisco she embarked on one of the great adventures of her life, traveling around Australia for 2 years. After her Australia trip, she moved home to Cleveland where she taught deaf children in the city school system. Judy met Michael Neuman, and they married in 1973. They made a wonderful couple, and enjoyed entertaining - whether opening their home to a graduate student newly arrived in the US, or hosting their famous sledding and Christmas tree cutting parties. Over the course of their 43 year marriage, they traveled extensively, including a year spent living in Zurich, Switzerland. They lived most of their married life in Cleveland, but moved to Memphis, TN in 1998 and then to Houghton, MI in 2003. Judy will be remembered for her unswerving devotion to her family. In the course of her life she always put her family first. She will be greatly missed. Judith Neuman is survived by her daughter Elizabeth Neuman Rose, son-in-law Joshua Rose, her grandchildren Emma Kathryn Rose and Christopher Michael Rose, and her brother Robert Borton and his family. Loving wife of the late Michael R. Neuman. FRIENDS MAY CALL AT BROWN-FORWARD FUNERAL HOME, 17022 CHAGRIN BLVD., SHAKER HTS., OH 44120 ON SATURDAY, MAY 19TH FROM 2:30 TO 4 PM, WITH A BRIEF MEMORIAL SERVICE BEGINNING AT 3:30 PM.